Mankind has evolved over millions of years surrounded by the natural electromagnetic radiation from the sun and the magnetic and electric fields of the earth. Part of the natural electric field of the earth are the so called Schumann Waves. These are very long waves of extremely low frequency, which are present everywhere in the atmosphere on this planet. The Schumann Waves have been identified as part of the natural electromagnetic radiation, which is particularly important for life on this planet. The human brain actually resonates with these atmospheric waves. The American National Aeronautics and Space Administration (NASA) have studied these Schumann waves extensively and have recognised the importance of these waves for human health. Space shuttles, leaving our atmosphere, are equipped with artificial Schumann wave generators to simulate the natural electromagnetic environment of the earth. Everybody has experienced stress in their lives with well known symptoms of headaches, sleeplessness, bad moods, etc. The fact is that these symptoms of stress are general response signals of the body, which can have a multitude of causes. Electromagnetic pollution can certainly be one of these causes. When people use mobile phones, they expose themselves to high levels of particularly aggressive types of electromagnetic pollution. This strains the body and the body is likely to respond with the well known stress symptoms such as headaches, etc. Mobile phone radiation strains the body by interfering with the natural electromagnetic operating system of the body. The list of potential damaging effects is growing steadily as international research progresses. Damage can occur even when stress symptoms have not yet been experienced. Because the symptoms are non-specific their cause is easily misinterpreted. All electrical appliances and electronic devices produce damaging electromagnetic fields (EMFs) or radiation, which we can’t see or feel. This Electromagnetic Pollution interferes with the body’s own electromagnetic operating system thus causing stress. Headaches are indicative signs that the body is under stress. This stress, of course, can have many reasons. 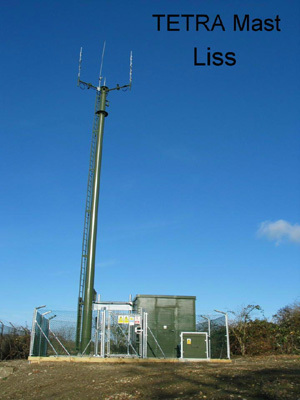 However, people often don’t realise that it could be due to EMFs. Old style computer monitors have cathode ray tubes in them, which actually emit a “cocktail” of frequencies ranging from extremely low to X-rays. The real danger here is from long term exposure, i.e. people working several hours a day at the computer. At CIR, we have realised that shielding from these fields and radiations is impractical because they are everywhere around us and very difficult to block entirely. We have therefore adopted the approach of counteracting these damaging radiations by strengthening beneficial energy within us and our near environment. Our products are thereby reducing the effects of interference, i.e. they are reducing electromagnetic stress. The EMF Harmoniser™ (approx. 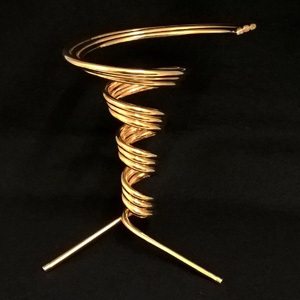 12cm height, 11cm greatest diameter), a smaller version of the Vortex Energiser™, has been developed to counteract these unnatural EMF’s. It has been attractively designed for use on the main EMF emitting appliances such as computers, TV’s, microwave ovens, etc. 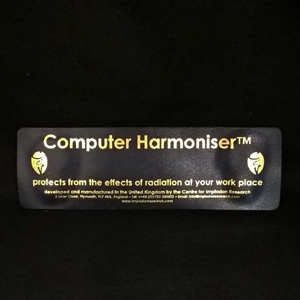 The Personal Harmoniser™ is a flat spiral and contains, like the Vortex Energiser and EMF Harmoniser, highly energised imploded water. 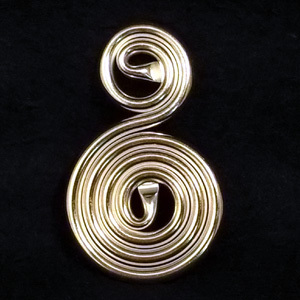 It is supplied with cord and can be worn around the neck or in a pocket. It will then enhance your natural defences against the damaging radiations coming from radio, TV and mobile phone transmitters, which fill our living environment. The Four-Spiral is particularly effective at counteracting electromagnetic radiation and can also be used generally to energise food and drinks anywhere. If you are interested in other applications for the Personal Harmoniser, please click on one of the other topics under the Application menu. 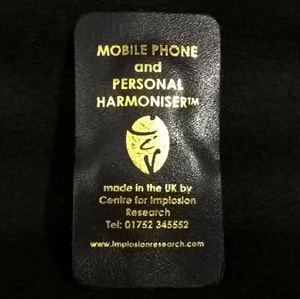 The Mobile Phone Harmoniser™ is a copper Personal Harmoniser, which has been bound and sealed in blue leather. It works and can be used in exactly the same way as the standard Personal Harmoniser. Some of our customers prefer the sleek look of the leather to the bare metal. The Computer Harmoniser™ is a protective device for the computer. It fulfils the same function as the EMF Harmoniser at a more affordable price. It is bound and sealed in leather and blends in well in a modern office environment. The Computer Harmoniser is fixed to the sides or the top of the computer monitor by means of two adhesive pads.